The world will be watching what happens next in Barcelona. Catalonia's regional parliament voted this afternoon to secede from Spain. The vote in the 135-seat parliament was 70 yes and 10 no with two blank ballots. Members of three pro-Spain opposition parties, after bitterly attacking the independence resolution, boycotted the motion and walked out of the chamber as voting commenced. And it marks another escalation of this existential showdown over the future of both Spain and one of its richest and most restive regions. In the next few hours, the Spanish parliament in Madrid is expected to vote to impose direct rule over Catalonia, dismissing the regional government and calling for new elections. 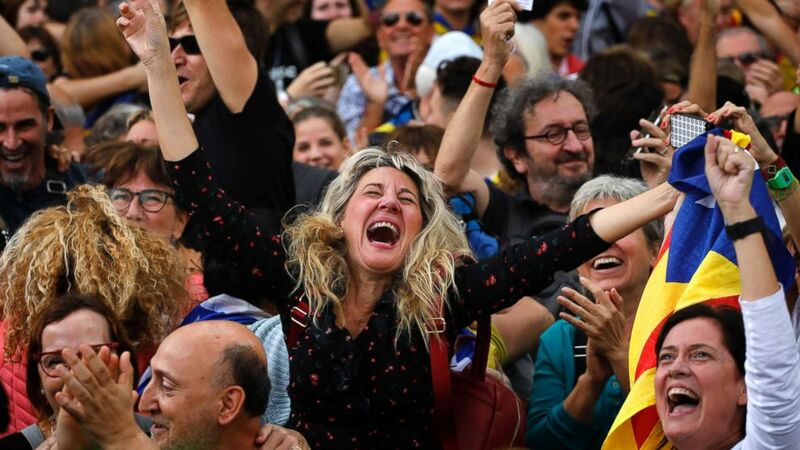 (Emilio Morenatti/AP) Maria Salut, center, reacts as they celebrate the unilateral declaration of independence of Catalonia outside the Catalan Parliament, in Barcelona, Spain, Oct. 27, 2017. 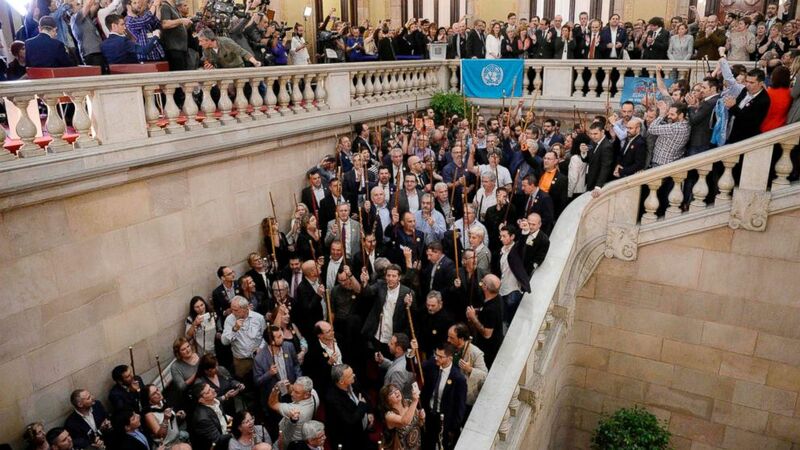 Catalonias' regional Parliament passed a motion Friday to establish an independent Catalan Republic. The possibility of violent clashes is very real. Spain could now try to take physical control over the institutions of government in Barcelona. That would almost certainly require the use of force that would likely be met with protests by Catalonians who have previously taken to the streets by the thousands in nonviolent demonstrations in support of autonomy. All this is the fateful — and entirely avoidable — consequence of previous steps taken in this crisis. Yesterday, the Catalonian president, Carles Puigdemont, seemed to relent to Spain’s pressure, calling for local elections and backing away from any immediate declaration of independence. Space seemed to be open for talks. All Puigdemont asked was for the Spanish government of Prime Minister Mariano Rajoy to step back from the brink and remove the threat of a takeover by Madrid. (Josep Lago/AFP/Getty Images) Catalan pro-independence mayors raise their batons after a session of the Catalan parliament in Barcelona, Spain, Oct. 27, 2017. Catalonia's parliament voted to declare independence from Spain with 70 votes in favor, 10 against and two abstentions, with Catalan opposition MPs walking out of the 135-seat chamber before the vote in protest. But Rajoy, who has taken the hardest of hard lines over any question of Catalan's quest for autonomy, refused. And so here we are. The U.S. State Department issued a statement today in support of Spanish unity. "The United States enjoys a great friendship and an enduring partnership with our NATO ally, Spain," State Department spokeswoman Heather Nauert said in a statement. "Catalonia is an integral part of Spain, and the United States supports the Spanish government's constitutional measures to keep Spain strong and united." The world will be watching what happens over the next 48 hours on the streets of Barcelona.